A New Oil Tank for Retirement Facility. Please help! Early this past summer, when our largest Marist Brothers’ retirement facility went through its annual safety inspection, everything seemed to be going so well. We were just about to enjoy a long sigh of relief. Then, as the inspector assessed the basement, everything went downhill. With cold weather only weeks away, we had to act fast. 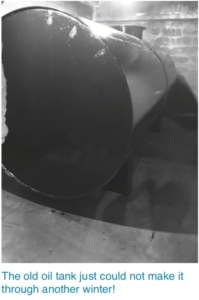 And so, a new 1,500-gallon oil tank was purchased, delivered, and immediately installed. save up. Apparently not! Time had run out. We used the $11,500 as a down payment, but we’re still a little more than $18,000 short. Your gift – whether $15, $25, or more – will be an enormous help! Can we count on your support? The company that sold us the new oil tank granted us one extra month to pay the invoice in full. I’m just not sure how we’ll raise $18,000 in time and meet the deadline without your help. We need every Marist Brothers’ friend to send whatever they can as soon as possible. Please...send your gift today. Our elderly and disabled Brothers will be so grateful! I have to admit...this was a tough purchase on many levels. First and foremost, we worried about the $18,000 that our budget couldn’t handle! So, we considered less expensive models. Then we worried about being penny wise and pound foolish – since the model we wanted is well constructed, rated high in safety, leak-proof, and corrosion-resistant. Spending a little extra meant we wouldn’t go through this again for a long time. And don’t our elderly and disabled Brothers deserve the ultimate in safety? I have faith that our Marist Brothers’ friends will send what they can – and I should stress that every gift makes a difference. It’s like the two nickels tucked in with my letter. Toss them in a glass jar and you have 10¢. Add loose change at the end of every day and the total in that jar keeps increasing. In the same way, once we add together every gift from every Marist Brothers’ friend, I pray we’ll have the $18,000 needed. To show their deep appreciation for your generosity, our elderly and disabled Brothers will be honored to pray for you and your special intentions. So please, remember to write your prayer intentions on the enclosed response slip and send it back to me with your gift. You are always in our prayers – and we look forward to including your prayer intentions. Before closing my letter, I want to thank you for your ongoing compassion and continuing support of our elderly and disabled Marist Brothers. May God bless you with abundant health and happiness.